Finally after a search of over two years we have sourced some proper coloured lenses to create some good looking coloured light signals. The cover plate is easily removed to allow easy access for bulb replacement. These signals are supplied on a 500mm pole. Why put a signal on a plug? While these signals are quite robust, exposure to the elements over the seasons will see its appearance suffer. By making them easy to install they can be put away in dry storage at the end of a days running. For the club scene they can be stored in a secure place away from out of hour visitors. Above - A standard 110v socket. -Oval Face, plastic pole mounted on a plug which allows them to be removed when not in use. Contains circuit board for track circuiting. -Use in the ground to allow plug signals to be put away. - Jubilee clip to angle iron post for quick installation. Check wiring - test board with link wire between L and SW terminals. If board works, trace wires and test rail connections. Check that the load bank bulb is working. Goes to green then you are looking for low loss - swarf in section breaks, excessive water on sleepers etc. Reverts to red then you are looking at a section short or wire fault - see below. As above + check if using override wire, this is not powered. A bulb at the end of a 30m wire is noticeably dimmer due to the resistance of wire. 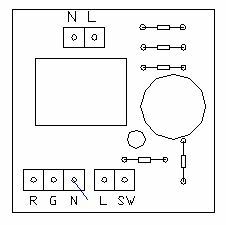 If possible feed power to signals in a central position. Check all connections are tight and dry. Wet connections can cause loss of power. The method of train detection has worked well on our own railway. It is not totally fail safe and should be used with this point in mind. All signalling set ups should be fully assessed before and during use. The use of high voltage power in the garden is covered under the building regulations and needs to be carried out by a competent person.